A miserable quarter for hedge funds was capped off with a miserable week. The quarter saw the reversal of several popular hedge fund trades and the worst monthly performance since 2002. In the past week, the market did not move much with the S&P down 0.72%. However, much of the damage for hedge funds was below the surface. According to Goldman Sachs, hedge funds are overweight the technology sector and net short the financial sector. Last week, the NASDAQ was down close to 2% and the financials rose over 3%, putting further pressure on hedge fund performance. The news of a Lehman resolution might help perpetuate the short covering rally in the financials. There is now potential for further redemptions, which is a wild card. I will not try to predict what will happen but will look to take advantage of a disconnect if it does occur. The economy continued to deteriorate with the 4 week moving average of unemployment claims at 440,250. 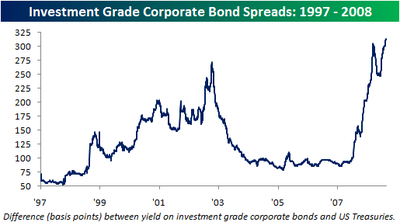 The credit crunch worsened with credit spreads widening on the week. Growth around the world is slowing and the effects of the stimulus checks are wearing off. We still have not seen the type of fear we saw that marked the bottom of the 2000-2003 Bear Market and valuations are fair at best. I don’t believe this Bear Market is over. However, in the very short term I am somewhat constructive on the market. The Bear Market rally off the July low is in its seventh week (the rally off the Bear Stearns bottom lasted over 8 weeks). While I believe the rally is nearing its end, I think it can continue for a while longer. At the end of a bear market rally sentiment is usually positive, with people declaring that the bottom is in. Currently, more advisors in the Investor’s Intelligence survey are bearish than bullish. Anecdotally, I don’t see a lot of bulls other than the usual permabulls. Early this week has positive seasonality and the market is still not overbought. In addition, while Friday’s point decline was large, market breadth was not bad and new lows did not expand. In a bear market the danger is always to the downside and this rally is getting old, so I am cautious. That said, I think the market tries to rally early in the week. I don’t usually have an opinion on currencies but the US dollar rally has been extreme. Everyone is now expecting a stronger dollar. When there is such an overwhelming consensus the crowd is usually wrong. This week’s Commitment of Traders report shows speculators with their second largest net long position in the US Dollar Index ever, while the smart money is heavily short the dollar. The last time speculators were so heavily long the dollar, marked the beginning of a long hard fall for the US Dollar. According to the Telegraph and Wall Street Journal Lehman is nearing a deal to raise capital and/or sell assets. It will be interesting to see if a resolution will help perpetuate the current rally in the financials or will the news be sold? The New York Times reports that people in Utah are filling up their gas tanks for the equivalent of less than 90 cents a gallon in natural gas run cars. It is nice to see that people are making adjustments to lower our dependence on foreign oil. While it is small in the bigger picture it is a good first step. Bloomberg gives the latest on Hurricane Gustav. This is a wild card that can have a large effect on trading next week and on the near term outlook for energy prices. The Wall Street Journal looks at stock buybacks. They can be the most effective way to return money to shareholders if a stock trades cheaply but a disaster if a stock is expensive or a company is over leveraged. The Wall Street Journal looks at the hard fall of some value investors. It seems to me that many of the value investors that took a fall in the past 2 years forgot two of Benjamin Graham's rules. A suitable value investment can not be too leveraged. Only invest in a business you can understand. Hence, are these managers really value investors? In the article Variant Perception I looked at why it is best to avoid being part of the herd. In the article Wal Mart vs. eBay I looked at which stock is safer. There is no one who agrees with me on the Seeking Alpha message board. That is the way I like it. In the article Short Dollar Trade Developing I explained why I think the Euro and Yen will see a bounce versus the dollar. Earlier this morning I opined that the market can use a rest today. I don't think a turnaround is in the cards for today but I do think we will get another rally attempt next week. Will the powers that be allow the market to go down into the election? Does the relative silence from OPEC after Oil fell 20% tell us who they are voting for? All thing considered I would probably use a rally next week to start building a short position. I trimmed some of my Yen position (FXY) into today's strength. There is some debate on the Seeking Alpha message board on my Ebay vs. Wal Mart story. It has been a pleasure writing for you this week. In addition, Citi is cutting back on photocopies. I suggest implementing a one square of toilet paper policy. That will get us out of this credit crisis. At least we are not in a recession. Most came into this week overweight tech and underweight banks. Yesterday, banks soared while tech languished. Today tech is looking lower on Dell's poor earnings. This is not an easy business. Earlier in the week I laid out my case for not shorting this market. I did not think that we could rally like this and thought there was a good chance we would go lower. Sticking to my discipline has saved me an uncountable number of times. I would be surprised if the market did not take a breather today after a large 2 day ramp. If this rally can extend into next week and the consensus becomes that we are going higher I will be laying out some shorts. Next week, when everyone is back from vacation, is when the real fun and games begin. Expect more news flow from companies and more movement in the market. Michael Steinhardt was possibly the best hedge fund manager of all time with an enviable track record. When analysts brought an idea to him he required that the idea be different from the market consensus. Of course, the idea had to have solid logical backing as well. He called this variant perception. I follow this tenet religiously. Every time I have an idea I try to figure out what the consensus is. If my idea is in line with the consensus I drop the idea. If everyone agrees with me what am I bringing to the table? Even if I turn out to be correct my idea is probably already priced into the stock. The action this week reminded me of why I follow this tenet. Sears Holding (SHLD) missed earnings estimates by a mile. Many smart investors that figured out that Sears Holdings was going to miss were short the stock. However, the stock actually rose because so many people were short the stock. If those investors would have looked around they would have seen that everyone was bearish on Sears Holdings. They could have saved themselves the pain if they paid attention to Michael Steinhardt’s rule. The same thing happened to Ultrashort Financials (SKF). We have had a drumbeat of bad news in the financials yet the stocks are creeping higher. Who is not expecting more write downs? What do these hedge funds that are short the financials know that the market doesn't? I am not suggesting just going against the crowd for the sake of it. The largest profits are in trades where you are both correct and against the crowd. I alluded to the fact that the financials looked ripe for a short covering rally this morning and wanted to elaborate. According to a report put out by Goldman Sachs earlier in the week Hedge Funds are net short financial stocks by 24%. That is a tremendous number. After a few days of relative outperformance, a short covering rally has begun today in financial stocks. Given the poor performance of hedge funds this year, I don't believe they have a high threshold for pain. I could see this morphing into something bigger if hedge funds begin to panic. I have no opinion on the financials and have no plans to buy or sell them. I am just pointing this out as something to keep an eye on. Which is a safer stock to own right now, Wal Mart or Ebay? The knee jerk response would be to answer Wal Mart as it just sounds safer. What is in a name? Was it logical to buy stocks in 1999 because they had a .com at the end of their name? Why is it more logical to buy a stock just because it doesn't have a .com at the end its name today? Unfortunately, that is what fund managers are doing today. They are selling Ebay and buying Wal Mart because Wal Mart is considered a safe stock to own in a recession. Analysts agree as the average analyst recommedation for Wal Mart is higher than Ebay. Should you listen to the analysts and follow the fund mangers? The same analysts that give Wal Mart a higher rating than Ebay are also projecting a higher growth rate for Ebay, including this year and next. Ebay sells for 13.5 times Free Cash Flow to Enterprise Value while Wal Mart sells at 17.3 times. That means that Ebay sells at a 20% discount to Wal Mart even though Ebay is projected to have a higher growth rate. In addition Ebay has over 4 billion in cash and no debt, while Wal Mart has net debt of over 36 billion dollars. That must mean that there is less uncertainty surrounding Wal Mart's business. Not so! Wal Mart was losing market share left and right before the economy turned south. Same store sales were barely keeping track with inflation and still are not keeping track with inflation. Does that mean the country needs to stay in a recession forever for Wal Mart to keep gaining market share? In addition, goods from China are becoming more expensive and Wal Mart utilizes China as much as any other retailer. Ebay's growth is slowing but that is normal as the internet matures and Ebay is effected by a slower economy. Ebay's business is also safe in the long run. Amazon and Yahoo both tried to create auction sites and failed miserably. Ebay has a virtual monopoly in internet auctions. There are no serious competitors even though people have tried. In addition, within Ebay are two high growth businesses, Skype and PayPal. If a growth multiple were to be applied to those two units, the auction business is being valued at closer to 10 times free cash. True safety is in the value of the company you buy, not in a name. In the short run the irrationality can persist but in the long run value will always win. Ebay is on my shopping list for the next time the market is feeling depressed while I am looking for a short entry point on Wal Mart. I am once again adding to my FXE (Currency Shares Euro Trust) position as it has reversed course. When I opined this morning that the Financials and Consumer Discretionary seemed vulnerable to some short covering I didn't realize it was going to start right then and there. It is probably being exacerbated by the low volume. With that in mind watch out in this thin volume. I don't watch financial TV but my internet connection was down this morning so I turned on the tube to see what was going on. I saw Ed Lazear from the Council of Economic Advisers saying that the GDP number proves the pessimists wrong. Really? I was quickly reminded why my TV was shut in the first place. If the pessimists were proved wrong then I don't want to be right. How stupid do politicians think we are? Is my internet connection down again or is the market really moving this slow? Took profits on the FXE (Currency Shares Euro Trust) I bought into the dip yesterday. I still have my original position and have not touched my Yen position (FXY). I now have a nice cushion on this trade and am ready to trim if they go higher and buy more if they go lower. This week J Crew and Darden (owner of the Olive Garden) both gave bleak business outlooks. What does it say about consumer spending if the good operators are losing sales? Didn't I learn in school that consumer spending was something like 2/3 of GDP? Who's numbers do you believe: US corporations or government statistics that say we are not in recession? You'll be happy to know that your stocks are down 25%, your mortgage is worth more than your house and you might lose your job but we are not officially in a recession. Even though J Crew and Darden whiffed earnings the stocks were barely down yesterday. That should give people who are short consumer discretionary stocks pause. I know I would be scared. On that note do you see the financial stocks starting to show a little relative strength despite the scary daily headlines? How can financial stocks go up given that they are dying to issue more stock and would probably use a rise to do so? How can financial stocks go down given the fact that hedge funds are so heavily short them (according to a Goldman report put out recently)? The Financials are the definition of a crowded trade and something I stay away from. Sears Holdings just put out ugly earnings. It will be interesting to see how the stock reacts. Tiffany's earnings doubled. Shoot, where's my wife? Volume is thin and the market has been chopping around aimlessly the last few days as many are taking the last week of Summer off. When trading is this slow caution is warranted as stocks could get pushed around pretty easily. I picked some week to start a blog about the stock market. I should have started a blog about watching paint dry. On that note I used this dip to slightly increase my Euro position (FXE). I like to gradually buy and sell stocks. This serves 2 purposes. 1) I am usually early so I don't get all in at one time . 2) Sometimes I buy a position that just chops around and I make money gradually adding and trimming from the position. Speculators are holding their second largest net long position in the Dollar Index. The Yen and Euro pulled back on the positive Durable Goods numbers. As per my rationale outlined previously I bought a small trading position in FXY (Currency Shares Japanese Yen Trust) and FXE (Currency Shares Euro Trust). "Pension funds are starting to move into the market for loans that fund indebted companies and buy-outs as they see opportunities for investment bargains." Given the decrease in bank lending and leverage this is probably akin to a band aid on a bullet wound but I want to show both sides of the story. The bearish tone of my posts must have you thinking that I should just get on with it and start shorting the market. I debate the issue several times a day. The main thing that stops me is sentiment. At the end of all the Bear Market rallies this year the crowd became bullish and declared the death of the Bear Market. However, it seems to me that no one trusts this rally. I want to see the crowd embrace this rally. There is not as much call buying as at previous tops. Sentiment surveys show more advisers are bearish than bullish and anecdotal evidence confirms this. A good case can be made that this time we won't see a dramatic increase in bullishness because the July 15 low was not very dramatic. The VIX barely climbed above 30 and the drop was downright tranquil compared to the moves we saw in the 2000-2003 Bear market. While it is possible that the Bear Market resumes at any time I want to see a better risk reward situation. No one ever got rich betting that this time is different. As an aside I will probably not be making the long Euro or Yen trade today. I wrote the positive piece on the Euro and Yen yesterday evening and both currencies rallied nicely overnight. I am not going to chase them. In a recent post I mentioned that hedge fund liquidations and blow ups would bring opportunities. I believe a long trade in the Euro and Yen versus the dollar is developing as a result of the hedge fund tumult. Hedge funds were heavily short the dollar a few weeks ago. That bet among many others began unwinding in July leading to a miserable performance for hedge funds. As a result of that unwinding the dollar is now at a multi month high against the Euro and close to a multi month high against the Yen. In early July it was conventional wisdom that the dollar was trash and going much lower. Super models and rappers demanded to be paid in Euros. On July 15, right before the vicious rally in the dollar speculators agreed with them. According to the Commitment of Traders Report speculators were net long 50,105 Yen futures contracts and 23,049 Euro futures contract. In contrast the smart money commercials were heavily long the dollar against both the Yen and Euro. Now that the dollar has already had a huge rally there is constant chatter about the strong dollar. Suddenly everyone is sure the dollar is going higher. The speculators agree as they are now net short 28,013 Yen futures contracts and net short 21,573 Euro contracts. All the while the smart money commercials are now heavily net short the dollar against both the Yen and Euro. This is precisely the type of situation I like to play. There is a deep oversold condition in the Euro and Yen. Sentiment seems one sided with everyone in agreement that the dollar rally will continue. The smart money is now long the Euro and Yen versus the dollar while the dumb money is short. In addition, the dollar started rallying a week after crude started tanking. Since crude stabilized last week, this week could be the dollars turn to reverse course. I am considering the purchase of FXY (Currency Shares Japanese Yen Trust) and FXE (Currency Shares Euro Trust). The news media tends to beat to death a different news story on any given day. I believe that there is no edge in focusing on the same thing everybody else is. What am I bringing to the table? Instead I will try to point out little watched news stories that may one day have larger ramifications. "Banks, securities firms and lenders have a record $871 billion of bonds maturing through 2009, according to JPMorgan Chase & Co., just as yields are at their most punitive compared with Treasuries. The increase in yields may cost them as much as $23 billion more in annual interest versus a year ago based on Merrill Lynch index data." If the economy worsens this can exacerbate an already bleak profit outlook. Higher interest costs mean less profits for shareholders. Some companies may be shut out of the debt market completely and forced to declare bankruptcy. Or things can get better and this becomes a non event. However, it is worth paying attention to as we get closer to 2009. I have a bigger picture fundamental view that we are in a Bear Market. However, one could be correct in that assessment and still get caught in a 20% bear market rally. Few can withstand such a hit. Timing is an extremely important element. There are 2 major tools I look at to help me time my trades. The first is sentiment. I look at surveys, option buying and anecdotal evidence to see when people turn too bullish in order to time my sales. In addition, I look at the health of the market. 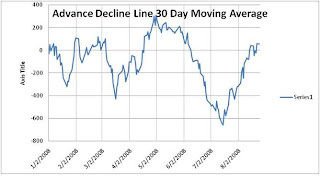 One indicator I look at to determine the health of the market is the 30 day moving average of the advance decline line shown below. This indicator is going to roll over today. However, at previous market tops this year this indicator rolled over 2 weeks before the market did. By that calculation the market should top out in approximately two weeks. If the market manages to rally next week this should make for a good setup the following week. Of course I will make sure other indicators are confirming the top. "Many banks and companies are paying more to raise money in the bond markets than at any time since the recession in the early 1990s amid signs that the financial crisis is deepening." Most people believe that money can not be made in a bear market. In a traditional buy and hold sense it is probably a difficult task. However, in chaos there is opportunity. During a bear market many people sell for non economic reasons. They can't take the pain of losing money every day and just want it to stop regardless of the value of the stocks. There are redemptions from hedge funds and mutual funds where mangers have no choice but to sell, not to mention margin calls. Often this will create opportunities in individual stocks and sectors. Last week we saw such an opportunity in the oil sector. Hedge fund managers were heavily overweight the sector. When the commodity had a correction the stocks started lower and caused a daisy chain of selling. Hedge funds quickly exited positions as they could not afford to risk triggering redemptions. A few hedge funds actually blew up. Oil stocks corrected by 22% in less than six weeks. Only 3% of oil stocks were above their 50 day moving average, a condition that will almost always lead to a bounce. Conoco Phillips got sold down to less than 7 times projected earnings. Sure enough, this led to an 11% bounce in less than three trading sessions. There will be more opportunities during this bear market. There will almost certainly be hedge fund redemptions as July was the worst month in many years for hedge funds. I will not try to guess what will be effected but will be waiting with plenty of dry powder when the disconnect occurs. There will be bankruptcies, bank runs and margin calls. During vicious sell offs there will be babies being thrown out with the bathwater. One must do their homework in advance to be able to identify the babies during the chaos. I will be spending my time doing my homework and creating a shopping list. The last week of Summer is usually pretty slow so my posts this week will focus more on the bigger picture and less on the choppy sideways action we are currently seeing. In assessing the market, the first thing I do is try to identify the type of market we are in, a Bear or a Bull. In a Bull Market, the market gets overbought and stays overbought. In a Bear market the opposite is true. Shorting the market in the past year when the market has been overbought has been a money bet. Two years ago, during the Bull Market, the same strategy would result in one being carried out. In a Bull Market the best strategy is to build a portfolio of stocks and fight the temptation to take profits. In a Bear Market it is necessary to have more of a trading approach. A case can be made that the Bear Market low was seen on July 14, 2008. If the Bear Market started in July 2007 the Bear Market will have lasted 12 months and taken the S&P down close to 25%. Both the duration and damage of the Bear Market are on the low side but within historical precedent. Valuations based on “projected” earnings are reasonable, as they usually are at the end of a Bear Market. Sentiment and news is clearly not on the optimistic side. The news is always best at the top and worst at the bottom. However, I believe that the Bear Market is not over. We are coming off the bursting of the largest Credit Bubble in history. As a result, I don’t believe that we will see one of the shortest and shallowest Bear Markets in history. Bear Markets have lasted as long as two and a half years. I believe we will see something closer in duration to that. In addition, we are only now starting to see the effect of unemployment, slower global growth and a world without stimulus checks. As such, I find projected earnings estimates suspect. Based on trailing earnings market valuations are not favorable. In addition, we have not seen the type of fear and purging of stocks that we did in past longer term bottoms. The VIX (fear index) barely rose above 30 while in the last Bear Market it rose over 50 on one occasion and over 40 numerous times. While I believe we are still in A Bear Market I want to respect the possibility that I am wrong. That is the reason I am not getting short now, but instead waiting for more optimism and hope that is typical at the end of Bear Market rallies. While I may be missing a good opportunity if we tank from here I will certainly not loose any money. Just some woulda, coulda, shoulda . It has now been close to six weeks since the market hit bottom on July 15. Prior to that, the market had cascaded down for over a month. Typically, after a waterfall decline the market gets a reprieve for at least three to six weeks and it is safe to buy. I am not sure why it works every time but I would venture to guess that after a grueling month long decline all the weak holders are washed out and the shorts start overplaying their hand. The reprieve is now over and the bear market can resume at any time. Typically, at the end of a bear market rally everybody is bullish and hopeful that the bear market is over. Sentiment surveys and anecdotal evidence suggest that at most people are a little less depressed right now. In addition, the market tends to get very overbought before the end of bear market rallies. While this Wednesday the market will be overbought it is not a particularly strong reading. That means that if this bear market rally ends this week we will not have seen the typical optimism and overbought readings we see at the end of bear market rallies. The July 15 low was not among the most climactic and scary lows so maybe that explains why the rally has been so lethargic. However, the market does have more room to rally. Fundamentally, I believe that the economy is getting worse. In the bond market, which is typically more sober than the stock market, credit spreads are as wide as they have been since the Bear Stearns debacle and have not improved during this rally. Unemployment is just starting to increase and global growth is slowing. The effects of the stimulus package are wearing off. Gas prices are a little lower but I believe the negatives far outweigh that one positive. However, fundamentals typically do not matter until they do. It is hard to know when they will begin mattering again. The way to make money this year has been to wait for the market to go to an extreme and bet on a reversal. Staying on the sidelines and waiting for the bulls or bears to push things too far has served me well. We are currently stuck in the middle. A good case can be made for going higher or lower. I believe this dictates patience. As Warren Buffet says, in the stock market there are no called strikes. If we had a piece of good news that reinvigorated the bulls and the market rallied into the overbought reading on Wednesday I would be willing to take a small short position. Other than that I will be sitting on my hands and fighting the urge to do something stupid.